Dynasty is a Chinese restaurant on St Thomas St and is owned by Suzanna Ho who also owns Obento and Zen. 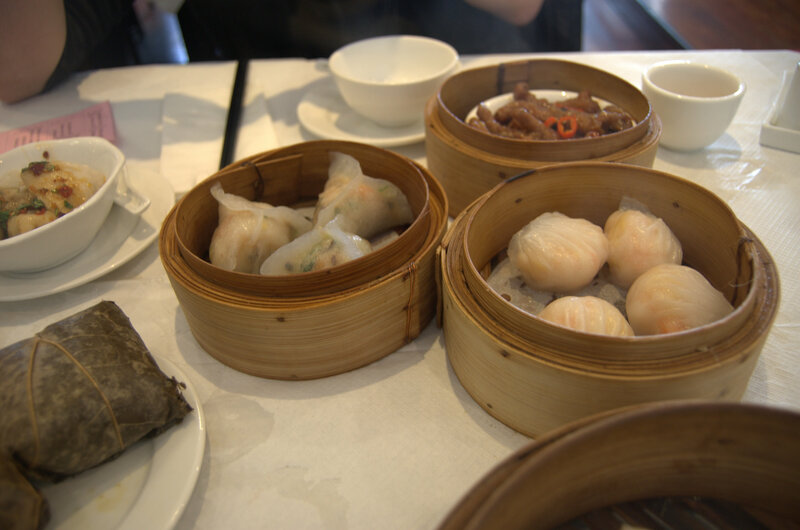 Every day between 12 and five they serve dim sum which involves a wide range of light dishes served alongside Chinese tea. A pot of jasmine tea (£1.20) is brought to the table as soon as we sit down and it gets refilled throughout the meal. Don’t worry about spilling the tea as even our waitress didn’t manage to stop the drops falling on to the paper table cloth. The restaurant was quite full on this Sunday, with nearly all tables gone and the ones near us hosting quite a few small children. I counted seven. There was much crying and enthusiasm from the small lunch guests and it was a vibrant environment but not unpleasant. A menu was provided which listed the name and number of the dishes alongside their pictures. To order, the number of the dish is marked off on a sheet provided to indicate how many portions are required. We order eight dishes and mark a ‘1’ on each of the locations signified by the dish number. The dishes are not grouped numerically but instead in terms of cooking style which is described in Chinese script. The first dish is quick to arrive and it is the Vietnamese spring rolls (£2.60). 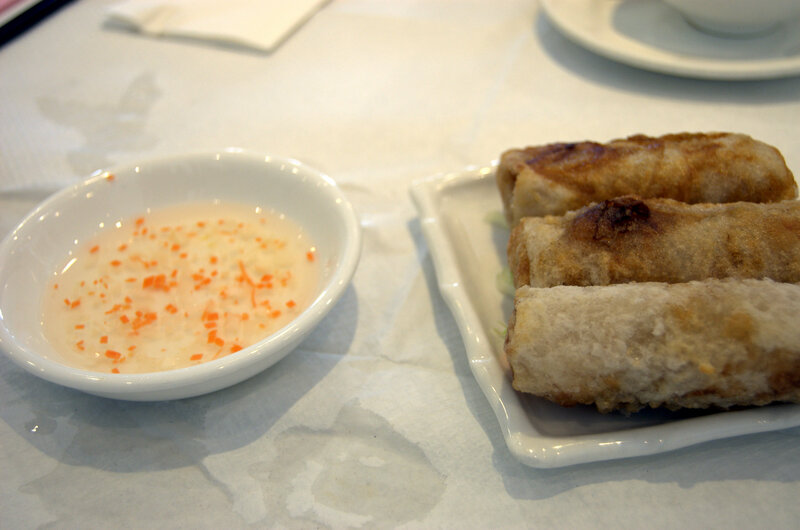 Three large spring rolls filled with a thin translucent rice noodle, king prawns, pork and bits of carrot. They were fried but not greasy – slightly puffed up, crispy and golden pastry on the outside. The clear dipping sauce was sweet and light with tiny flecks of carrot. There is a wait of a few minutes before the next six dishes arrive all together. The prawn dumplings (Har Kau £2.90) are made with a mix of king prawns and shavings of ginger surrounded by a translucent steamed wonton wrapper. The steamed pak choi and prawn dumplings (£3.20) are similar with ginger flavoured king prawns but accompanied by pak choi, chestnut and cabbage. The chicken feet (£2.60) dish is an unusual choice and was mostly inspired by the conversation at last night’s supper club. They were deemed particularly tasty by one of the guests and chosen today in the spirit of trying something new. They were soft and sweet although quite bony in the toe areas. I managed three and they were spicy, and with a hint of aniseed. My companion had half of one but with extreme reluctance although he admitted that while they tasted quite nice he just couldn’t handle the gelatinous parts. The steamed Szechuan chilli dumplings (£3.20) are very spicy and filled with a pork filling. The sauce is fresh, fragrant and salty. 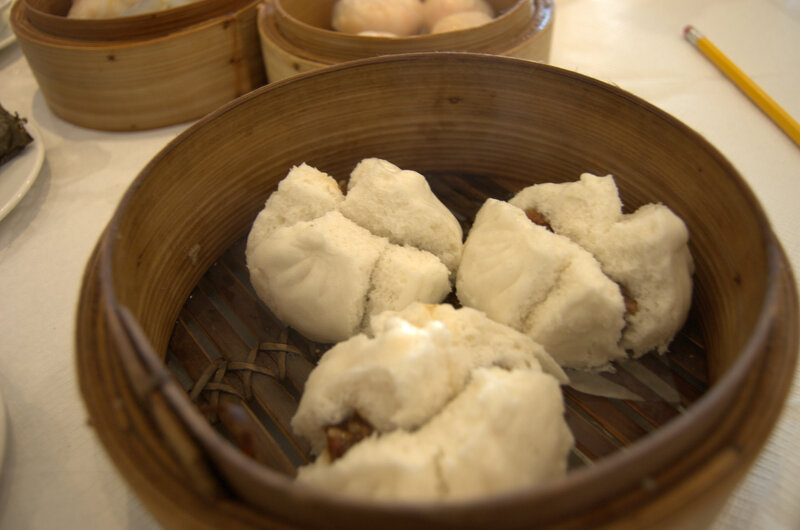 There are three steamed pork buns (Char Siu Bun £2.60) in the next dish which used to be a favourite of mine and my sister’s in Melbourne. The steamed doughy bread-like exterior almost counts as a comfort food and encapsulates the sweet BBQ pork filling. 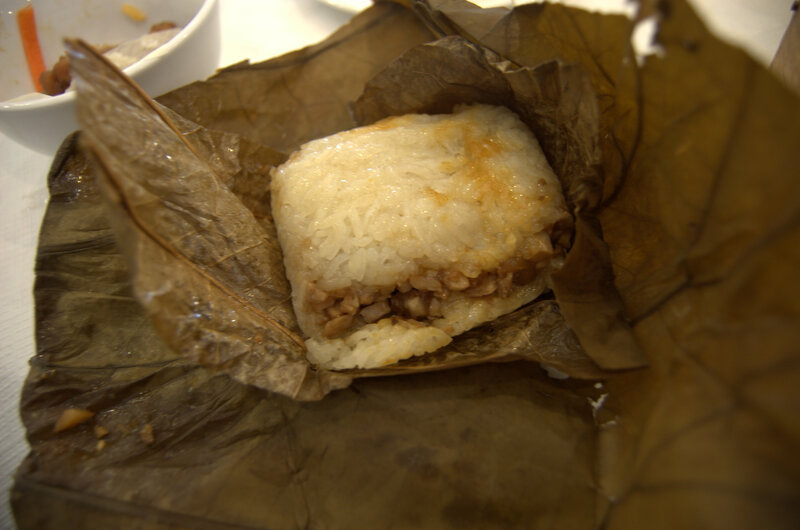 The sticky rice (Glutinous rice £3.00) is served as a parcel wrapped in lotus leaf. The rice is stuffed with a mix of pork, shrimp, rehydrated mushroom and chestnut. There’s a savoury and sweet flavour ranging from the sauce to the starchy sweetness of the chestnut. The fried shredded squid (£2.90) was the eighth item we requested but it hadn’t yet arrived by the time we were finished all the other dishes. I was quite full and suggested we cancel the dish and go, but my companion offered to eat the whole thing himself if I couldn’t manage it so we prompted the waitress to check what was happening. When it arrived it was a golden yellow colour and accompanied by a sweet dipping sauce in a shallow dish. 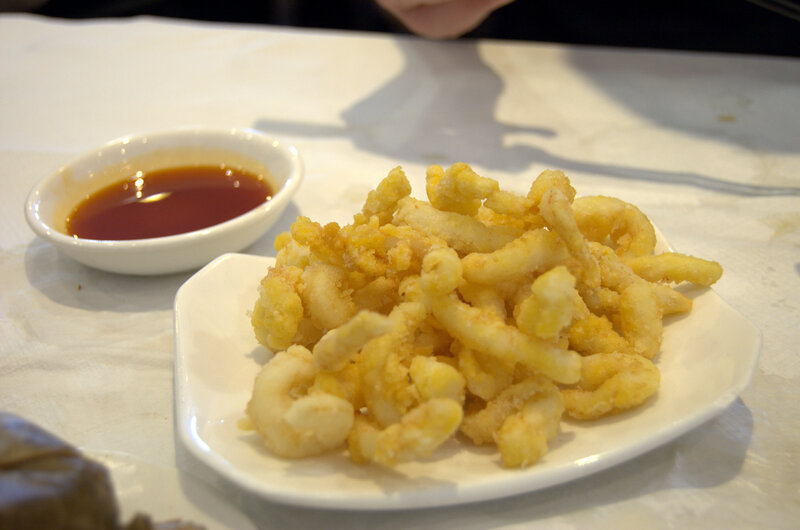 Small golden, crispy strips of squid were light and tasty and a sweetness came through with the firm texture. The batter was crispy but left a slightly powdery sensation which melted into the flavour of the squid. The service was included in the bill so we didn’t leave an additional tip. The best dish was the shredded squid and even though I was quite full I managed to help eliminate half of it. The most adventurous and quirky one was the chicken feet and while I enjoyed it I probably wouldn’t order it again. We were half way through our meal when my companion enthused that we should go to Hong Kong and try more of these dishes in their natural environment. It was the same thought that led us to insisting we should go to Spain after dining at El Puerto. Nice food can be quite inspiring and it was a pleasant break away from normality to a tasty food haven in a side street between Bristol Bridge and Bristol Temple Meads. This entry was posted in Bristol and tagged Bristol, Dynasty, Food, review. Bookmark the permalink. I’m glad you tried the chicken feet! Among the best things that no one eats. Not been to New Emperor Court, must check it out. Thanks!